Insert-A-Shaft CRL Series 15 NEW! Insert-A-Shaft CRL Series 20 NEW! Insert-A-Shaft CRL Series 30 NEW! IAS CRL Series 30 Metric NEW! When looking for a cost-effective and efficient solution for your rod cylinder application, you may be looking at many different options. The trick is to fit your rod cylinder to the requirements of your application, and with our OVLPRO options, we can help. 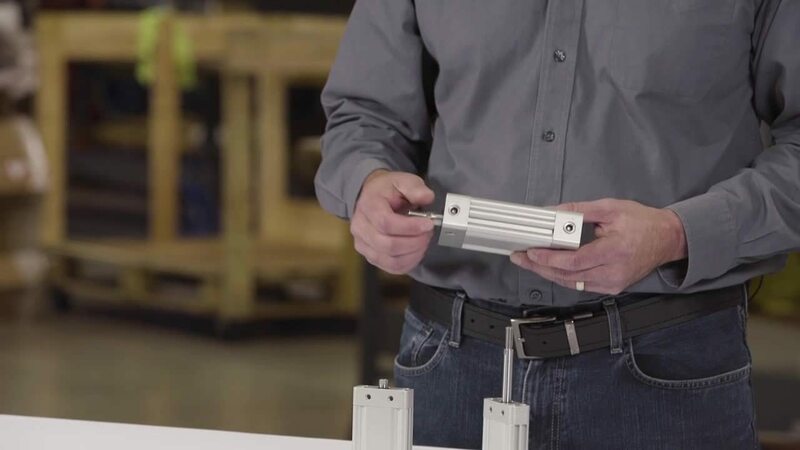 Here’s how to properly size and select the right OVLPRO rod cylinder, from our VP of Engineering & General Manager, Chad Randleman. Then, compare that to the adequate bore size and pressure available to determine the cylinder force. With rod cylinders, it’s important to consider that the extend and retract motions of the rod cylinder do not have equal output force. This is because the rod side of the cylinder decreases the net effective bore area on the rod side. So, you’ll need to calculate pressures and forces on both sides of the cylinder to make sure they’re suitable for your application. If the cylinder is supporting and guiding the load on its own, you’ll want to compare that with the maximum load vs stroke length requirements to make sure it falls within the guidelines. Excessive loads at longer stroke lengths can apply too much bending movement on the rod, causing issues. Confirm that the internal cushions of the cylinder fall within the guidelines of the maximum load vs velocity requirements. If the internal cushions are not adequate for your application, external shock absorbers can be added. For more information on OVLPRO rod cylinders, check out our brochure by clicking on the button below.